“You can’t cry–it will ruin your mascara,” we told my friend Erin last night, as she opened up our hand-written notes attached to the Kentucky care package we had created. This statement elicited even more laughter, as we all gazed appreciatively at Erin’s right eye, and only her right eye, which had been made up to look almost exactly like the ‘Smokey Eyes’ tutorial on the website. Almost exactly. Except for maybe a little bit of purple and blue under her eye that might have looked a little bit like the results of a boxing match. We decided that maybe we should all have only our right eyes made up Smokey style, and then take a photo together. It seemed important; But then we got distracted by a good story, which is usually the case. An eternity ago…or back when our children were itty bitty, our group saw each other in person on a regular basis, as we struggled to navigate our newly formed lives as mothers. We gravitated toward one another, with shared goals and values and the secret hope that our sidelined careers and all those trips to the park and picnic lunches on each other’s kitchen tables (ten or more kids needing apples sliced and juice poured) would be the right choice in the end. Now we know it was; and not just because of the memories and time with our children. We gained even more during those years: each other. Admittedly, there have been times when I have questioned whether or not I fit in; that’s my own insecurity left over from a few mean middle school girls. But time and time again, these girls prove that we don’t have to be the same to love each other. We all have our childhood friends, our work friends, our neighbor friends…but these are my ‘Playgroup’ friends. We just, uh…play a little differently now that the kids aren’t around. Last night, early 90s rap playing in the background, bottles of wine and ice cream flavored bourbon (seriously!) getting emptied, we shared funny stories, secrets and worries, like we have for the last decade. At one point we were talking about our upcoming middle schoolers, and how kids cycle through these phases. All of the sudden I was transported back to hundreds of identical conversations about our kids; all of them full of support and ideas and shared experience of what works and what decidedly does not. It is not just our kids who cycle through phases. 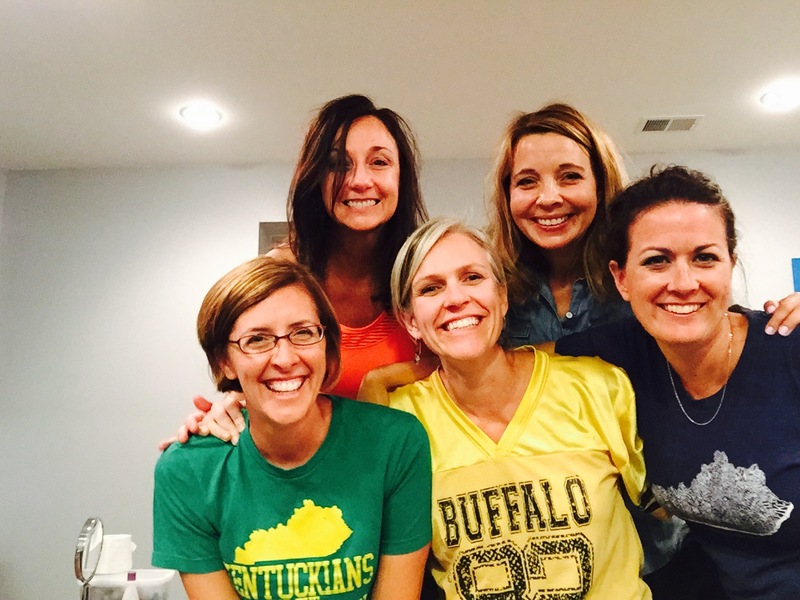 We’ve come a long way girls: from rotating friday lunches and preschool car-lines….to bunco and bookclub and any other excuse to escape our houses together on a weeknight…to back to work and drinks out to celebrate (how many Saul Goods have we closed down? )…to knowing that sometimes all we need are our pajamas and some alone time together. And Smokey Eyes…we need those too. But just the one eye. It wouldn’t make sense to do both.